Happy Thanksgiving everyone! I hope you had a fulfilling holiday full of family, friends, laughter, food and blessings. 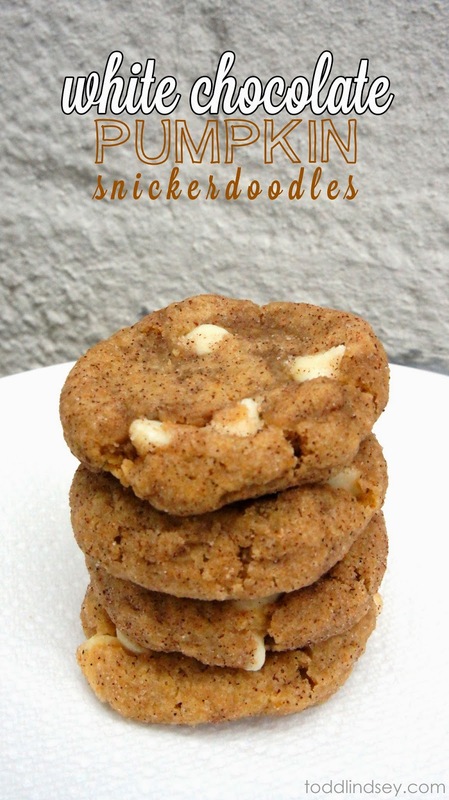 :) I bring to you today an awesome holiday cookie recipe... White Chocolate Pumpkin Snickerdoodles! They are extremely soft and chewy and not overly pumpkin-y. I could make and eat these all through Halloween, Thanksgiving and Christmas! Enjoy the recipe! In a medium bowl, whisk the melted butter, brown sugar and 1/2 c sugar until there are no lumps. Whisk in the vanilla and pumpkin puree. In a large bowl, whisk the flour, salt, baking powder, baking soda, 1 1/2 tsp cinnamon and pumpkin pie spice. Add the wet ingredients to the dry ingredients and stir with a spoon until combined. Cover the dough and chill for 30 minutes. Mix the remaining 1/2 c sugar and 1/2 tsp cinnamon together in a small bowl. Roll the dough into balls, about 1 1/2 tbs of dough per ball. Place the cookie on an ungreased baking stone and carefully flatten. They will not spread a ton so you can place them fairly close together. Allow the cookies to cool for 10 minutes on the baking stone before removing to a wire rack. Store at room temperature in an airtight container for up to a week. Awesome recipe! I love chewy cookies. These sound so yummy! Thank you for sharing all those recipes with us! I love all the recipes as well! You do such a great job of displaying your goodies. Totally wish I was your neighbor so I could do the neighborly thing and test your recipes haha. You always bake such tasty looking things =) Thank you for sharing the recipes! Happy New Year Lindsey! Wishing you all the wonderful things in 2015!